That's both reassuring ("If we need help, someone will help!") and scary ("Yikes! We may have to respond to a mayday!") We thought about this last rule in Georgian Bay and the North Channel, on the days when we'd travel for hours and never see another boat. We thought about it when we read, in our guidebook, that in these northern waters, there so few towns (and so few marinas with towing services), if you have engine trouble, don’t expect a tow; you’d better be ready to handle the situation yourself. He repeated the message several times, in rapid succession. He sounded a little frantic. We were about a mile offshore, in sight of the slim red light tower and the gaudy yellow water tank that mark the Algoma skyline. To the west, a small fishing boat was chugging towards the harbor, with nets and rods set at a jaunty angle. Between our boat and the shore, a white cruiser was sitting side-on to the waves. It didn’t seem to be moving. Was it a couple of fishermen at anchor? We didn’t want to go steaming up and rescue someone who was totally fine. Besides, Algoma is a hot destination for salmon fishermen, and it has multiple marinas. Surely someone else would help the guy on the radio. Hmmm. We weren’t actually sure whether we COULD. We were running on diesel—our 60 HP Yanmar—rather than the 12 HP electric motor. So that was good—we had our maximum muscle available. But was that enough for a tow? We didn’t really know. Though the forecast was “waves less than two feet,” the swells looked more like three. It felt like our boat had all she could do just to push herself up and over the crest of each swell. And the churning water would make tying up to the other boat tricky--not to mention the towing part. But the Rules of the Road say, You Have to Help. So we maneuvered the Dragonfly between the stranded boat and the shore. The skipper, an older guy, was sitting a little precariously on the flat bow, with a tow rope already tied to the bow cleat. A younger guy was in the cockpit. “I don’t know what’s wrong—I think maybe it overheated?” the skipper said. He seemed pretty stressed. Meanwhile, his passenger seemed like he didn’t have much boating experience; he deferred to the skipper and, when we suggested putting out a fender, didn’t quite seem to know what we meant. We tried tying the stranded boat to our side first, giving the two boats the same configuration that a tugboat uses to guide a barge--kind of giving it a nudge at the hip. Given the conditions, Captain thought that would be the safest way to shepherd her in. So finally we decided to just tie the white cruiser's tow rope to one of our stern cleats, setting up a true towing configuration, it would mean moving our dinghy from the "tow" position and tying it up alongside the mother ship. We were worried about the oarlocks gouging the paint, so we quickly jury rigged some fenders as padding. Then we turned to the cruiser. The skipper was still sprawled on the bow of his boat. Because we’re so new at all this we tend to assume everyone else knows more than us, and we didn’t want to give orders. But it didn’t seem like the safest place for him to be while we were towing—what if the rope snapped and flew back into his face? What if there was a big wave and he lost his grip? He wasn’t wearing a PFD. His face was pretty red. The skipper made a face. But he clambered around the narrow gunwhale and gingerly, as the boat heaved up and down, climbed back down into the cockpit behind the protection of the windscreen. We ran slowly, to reduce the pitching in both the boats. The rope seemed impossibly slim for the job—and also rather short. The skipper made most of the trip standing up, talking rapidly into his cell phone. I’m not sure how long it took to get the boat into the harbor. Probably about 45 minutes, though it seemed longer. Despite the care we’d taken in tying it up, the dinghy banged against the side of our boat, chipping away paint. One of the fenders we’d strung between the dinghy and our boat worked loose in all the pounding and heaving, and floated away. Bummer! New fenders are far more expensive than you’d think for a simple sausage of inflatable plastic. But we weren’t about to go back for it. Finally, with a huge feeling of relief, we threaded the narrow gap between two breakwater walls, entered the Algoma channel, and made a slow turn to leave the boat on the port dock. I patted Dragonfly on the gunwhale. Good boat! You did it! A bearded man and a woman in shorts came down to the dock as we approached. We’re so used to gongoozlers, we assumed they were curious bystanders, but the man signaled me to throw him the line, greeting the cruiser captain with relief. The woman tried to hand Bill some money. He waved her off. After all, we’re in the Brotherhood of the Boaters now, and we know the Rules of the Road. Wow, another experience to tell your grandchildren about someday. I don't care whether you are experienced in rescue or not, you did a great job getting everyone back to dock safe and sound. Good for you! Wait, wait! I was hoping this story would morf into a murder mystery! What were these landlubbers doing out there? Great job! Congratulations on a safe rescue! You mentioned that you assume everyone out there knows more than you but with the experiences you're having, you're going to quickly start knowing more than everyone else. Plus you have the benefit of having taken a Power Squadron Boating Course on your side! I will make only one suggestion, it might even be a requirement. Next time you have to tow someone, please make sure everyone on both vessels are wearing PFD's; you are the towing vessel, you are the responsible party, you can give the orders. By the way, you included a picture of a BoatU.S. 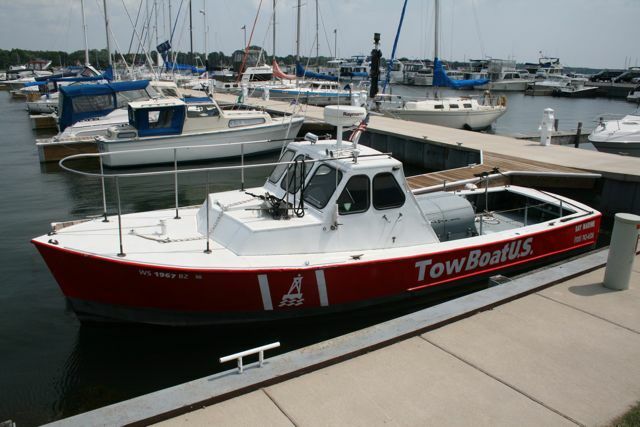 Tow Boat, did you know that Power Squadron Members get a deep discount with BoatU.S. if they have a problem and need a tow? It's true! Dotty, I THINK these guys were just fishin' though--who knows! Maybe there was a body in the bilge. The mystery to me is why none of the marinas was monitoring channel 16 and able to help these guys out. I guess that's a good demonstration for US of the maxim that you can't assume someone will come to your rescue, you have to be prepared to deal with problems yourself. We always wear our life jackets when we're docking, since I'm running around on that little ledge. One time, there were some little kids at the dock as we approached, and it was cute to hear one little boy say, "Look, they're being safe!"